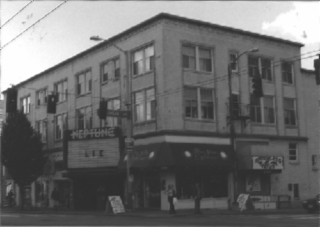 The Neptune Theatre opened Wednesday November 16, 1921 at 7:00 pm for its inaugural show. On opening night, it featured Raoul Walsh’s “Serenade,” the comedy “Robinson Crusoe Limited.” A newspaper article from 1921 claimed the Neptune to be one of the finest suburban movie theatres. The original owners of the building were E.L. Blaine and A.B.L. Gellerman, and the Puritan Theatre Company owned the theatre. The theatre seated over 1,000 people and was equipped with a Kimball Unit Orchestra Organ that cost $26,000. Henderson Ryan, who designed the Liberty Theatre at First and Pine, designed the Neptune Theatre Building. Ryan was known for his ramp design that allowed people to walk up to the balcony without going up steps. In the Neptune Theatre two inclines led up to the balcony, one passing the ladies room and public promenade, and the other along the ushers’ room and men’s room. Charles Weisenborn and Carl R. Berg did the interior decorating of the theatre. The interior design was centered on an undersea theme, apropos for the Neptune Theatre. Heads of Neptune surmounted the cornice of the walls of the main floor. Shell and trident motifs were used throughout the theatre. According to a newspaper article: “Frescoed panels under sea scenes begin about the middle of the theatre and extend towards the back. Enclosed in kelp growing on either side and gracefully waving across the top are different species of Southern sea fish and sea plants. One panel attracted special attention due to its peculiar striped fish that swim among coral trees and sea cactus.” The walnut theatre seats were covered in blue faux leather and the main stage curtain was made of taupe velvet with a blue velvet lambrequin. The ladies restroom was decorated in blue, gold and tan. The Neptune Theatre Building is a three-story corner commercial block distinguished by its two-tone masonry detailing. The windows on the second and third floors are paired double-hung windows with multi-paned upper sashes. Each of the storefronts has had windows and doors replaced. The original window sashes survive on the second and third stories. Four stores occupied the storefronts on the street level; one a pen and camera shop, a dairy product and lunch counter, millinery and ladies furnishing shop and a confection shop. The second floor of the Neptune Building was originally occupied by several dentist offices, one of which contained the only separate sterilizing room “West of New York,” physician and surgeon offices and a chiropractor. The third floor contained eight two- and three-room apartments. Architect Henderson Ryan was born in Alabama and was educated at the University of Kentucky. Ryan arrived in Seattle in 1898 and practiced from 1900-1923. During his time as a practicing architect in Seattle, Ryan supervised the design and construction of many buildings, including the Moore Building, Waldorf and Roycroft Apartments, the Broadway Building, and the Ballard Library. The Neptune Cinema Building is significant because of it's innovative interior architectural design and as a theatre within a multi-family and commercial building. Nielsen, Roy. UniverCity: The Story of The University District in Seattle. Seattle: University Lions Foundation, 1986. "New U-Neptune Theatre to Give Initial Performance Wednesday." University District Herald, November 11, 1921.